It’s unbelievable the amount of money today’s youth spend on things like cosmetics, apparels and mobiles. Go to any coffee shop and you will see teenagers spending over Rs. 100 for one coffee. Probably, I am an old timer, but I am just not able to digest this fact. And, this is not the case only with rich kids, the spending happens across the board. An ASSOCHAM study conducted on the eve of “World Youth Day”, celebrated on August 12th, shows that about 75 percent of Indian youth (16 – 21 years old) spend more than Rs. 6000 on cosmetics, apparels and mobiles. The findings were based on interactions with 2000 youngsters in 10 Indian cities. It revealed that their cosmetic consumption has gone up by about 65 percent in last 10 years. 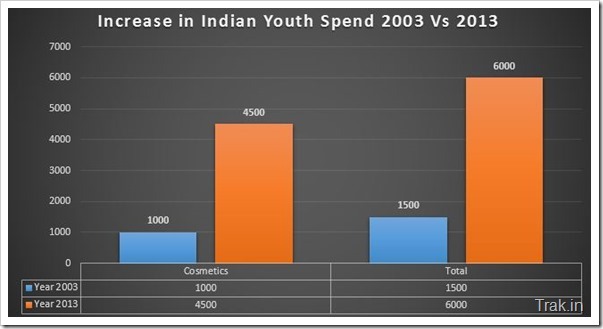 10 years back, in 2003, the average expenditure done by urban Indian youth was less than Rs. 1500, which has risen multifold to Rs. 6000 in 2013. According to the study, cosmetics and apparels account for majority of this spend. Majority of Indian youngsters spend over Rs. 4500 per month on cosmetics alone. This clearly points to the fact that looking good and appearances are increasingly becoming important to them. The rise in spending has been more pronounced in last 3 years since 2010 as compared to previous years. Eating out is also one of the passions of today’s youth with around 15 percent of the pocket money is now being spent on food items as per the survey. Interestingly, male counterparts spend more on cosmetics compared to females, mainly on items like men’s hair care products, deodorants, razors and blades. Brands also play an important role for today’s Indian youth with 85 percent of them preferring expensive branded quality products over cheaper local ones. The most surprising finding (which I am not too sure of) is that according to survey male consumers frequently change their handsets as many as two or three times in a month and generally have two mobile handsets with them. On the whole, about 68% of survey respondents spend about Rs.1,000 to 15,000 for cosmetics, Rs.3,000-25,000 for apparel, Rs.5,000-35,000 for mobile on yearly. The rest of the respondents spent an amount in the range of Rs. 500-5000, Rs. 2500-5000 & 3500-10,000 respectively. The survey by ASSOCHAM has some discrepancies when it comes to spending and some findings seem to be little exaggerated or skewed. Things like changing mobile handsets so frequently may not be a regular occurrence. However, it is clear that for today’s Indian youth, especially from cosmopolitan cities, exterior looks have become quite important and they will go at lengths to maintain it. At the same time, income of middle class Indian consumers now have deep pockets, which reflect of spending of today’s youth. True. Nowadays people buy cars worth lakhs . In early 20th century only the select few rich spent on cars. The rest did not have such silly dreams. 1) The survey could have been termed 75% of Indian “urban”, “effluent” youth spends 6Kpm on fancy things. 2) Another thing which comes to mind when reading that the same was 1.5Kpm in 2003 was probably because of inflation and lack of smart phones and so many coffee shops then. 3) Also another hilarious difference between now and then (2003) was back then there was no Fair and Handsom and other men’s cosmetics. Youngsters were content with Jeans and glasses.